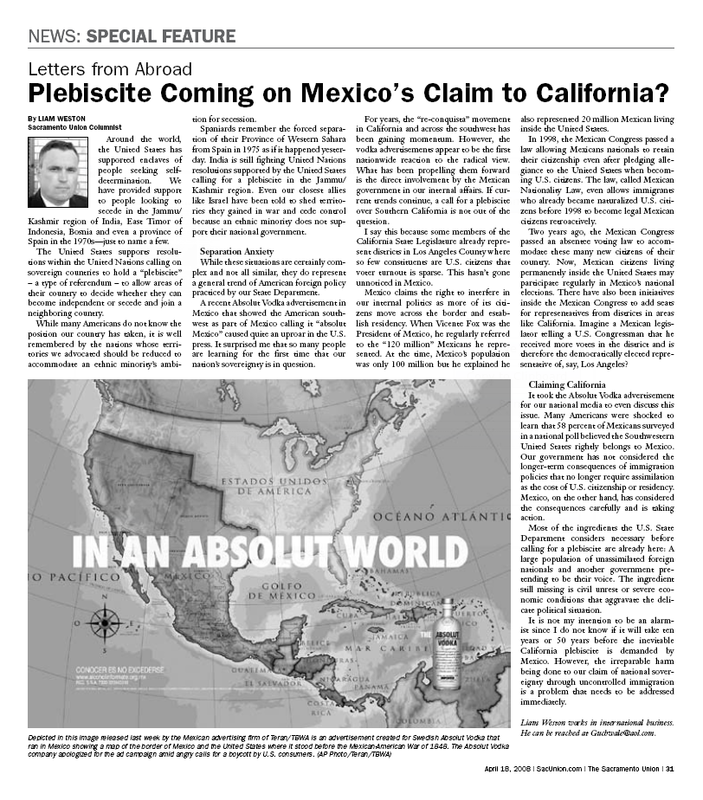 Above is a news article entitled “Plebiscite Coming on Mexico’s Claim to California?” by Sacramento Union columnist Liam Weston. Weston notes with indignation and alarm that 58 percent of Mexicans surveyed in a national poll believe the Southwestern United States rightly belongs to Mexico. But Mexican migration to the southwest in recent decades is not the reason Mexicans believe the southwest rightly belongs to Mexico. Mexicans believe the southwest rightly belongs to Mexico because the US extorted it from Mexico at gunpoint in 1848. These Hollywood stars neither know nor care that Mexican claims to California have far greater validity than Tibetan nationalists’ claim to a “Greater Tibet.” Or conversely, that China’s claims to Tibet have far greater validity than US claims to California. If “You can’t turn the clock back” because “Too much time has passed, and what’s done is done,” then why are these Hollywood stars attempting to turn the clock back for the Tibetan region of China, but not for the California region of the US? In fact, China’s vastly more compelling claim to Tibet doesn’t end there. As noted above, the US acquired California by invading Mexico and extorting California from Mexico at gunpoint. China did not acquire Tibet by invading Tibet and annexing Tibet. Tibet became part of China when the Mongol Empire, with Tibetan collusion, invaded and conquered Song dynasty China during the 13th century. Once the Mongolians completed their conquest of “Han China,” they used Tibetans to control the Hans. The Mongolians established a three-tiered hierarchy. The top tier was the conquering Mongolians, the middle tier was their Tibetan allies, and the bottom tier was the conquered Hans. Far from being innocent victims, Tibetans were accomplices in the Mongolian conquest and subjugation of China — as China was defined in the Song dynasty. Many Dalai Lama acolytes don’t even know that the honorific title “Dalai,” as in “Dalai Lama,” is not even a Tibetan word. It is a Mongolian word. It was first conferred upon leaders of Tibet’s lamaist theocracy by the ruling Mongolians during the Yuan dynasty. It was later conferred upon Tibet’s theocrats by the ruling Hans during China’s Ming dynasty, and the ruling Manchus during China’s Qing dynasty. That’s right. The Dalai Lama has traditionally derived his authority from China. When the Mongolian-dominated Yuan dynasty collapsed, the Han-dominated Ming dynasty inherited the realm of the Yuan dynasty, including sovereignty over Mongolia and Tibet. The bottom line? China’s claims to Tibet are, if anything, far more compelling than US claims to California. Either the US owns California, or it doesn’t. If the US owns California, then China owns Tibet. If the US feels it has a strong case for the ownership of California, then China has an infinitely stronger case for the ownership of Tibet. Below you will find the text of the aforementioned news article. Plebiscite Coming on Mexico’s Claim to California? Around the world, the United States has supported enclaves of people seeking self- determination. We have provided support to people looking to secede in the Jammu/ Kashmir region of India, East Timor of Indonesia, Bosnia and even a province of Spain in the 1970s—just to name a few. The United States supports resolutions within the United Nations calling on sovereign countries to hold a “plebiscite” – a type of referendum – to allow areas of their country to decide whether they can become independent or secede and join a neighboring country. While many Americans do not know the position our country has taken, it is well remembered by the nations whose territories we advocated should be reduced to accommodate an ethnic minority’s ambition for secession. Spaniards remember the forced separation of their Province of Western Sahara from Spain in 1975 as if it happened yesterday. India is still fighting United Nations resolutions supported by the United States calling for a plebiscite in the Jammu/ Kashmir region. Even our closest allies like Israel have been told to shed territories they gained in war and cede control because an ethnic minority does not support their national government. While these situations are certainly complex and not all similar, they do represent a general trend of American foreign policy practiced by our State Department. 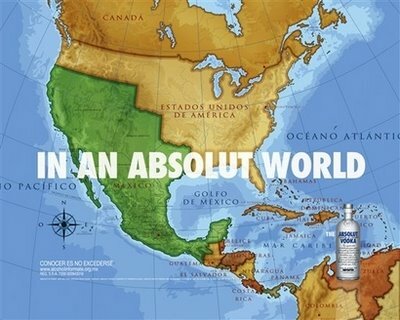 A recent Absolut Vodka advertisement in Mexico that showed the American southwest as part of Mexico calling it “absolut Mexico” caused quite an uproar in the U.S. press. It surprised me that so many people are learning for the first time that our nation’s sovereignty is in question. For years, the “re-conquista” movement in California and across the southwest has been gaining momentum. However, the vodka advertisements appear to be the first nationwide reaction to the radical view. What has been propelling them forward is the direct involvement by the Mexican government in our internal affairs. If current trends continue, a call for a plebiscite over Southern California is not out of the question. I say this because some members of the California State Legislature already represent districts in Los Angeles County where so few constituents are U.S. citizens that voter turnout is sparse. This hasn’t gone unnoticed in Mexico. Mexico claims the right to interfere in our internal politics as more of its citizens move across the border and establish residency. When Vicente Fox was the President of Mexico, he regularly referred to the “120 million” Mexicans he represented. At the time, Mexico’s population was only 100 million but he explained he also represented 20 million Mexican living inside the United States. In 1998, the Mexican Congress passed a law allowing Mexicans nationals to retain their citizenship even after pledging allegiance to the United States when becoming U.S. citizens. The law, called Mexican Nationality Law, even allows immigrants who already became naturalized U.S. citizens before 1998 to become legal Mexican citizens retroactively. Two years ago, the Mexican Congress passed an absentee voting law to accommodate these many new citizens of their country. Now, Mexican citizens living permanently inside the United States may participate regularly in Mexico’s national elections. There have also been initiatives inside the Mexican Congress to add seats for representatives from districts in areas like California. Imagine a Mexican legislator telling a U.S. Congressman that he received more votes in the district and is therefore the democratically elected representative of, say, Los Angeles? It took the Absolut Vodka advertisement for our national media to even discuss this issue. Many Americans were shocked to learn that 58 percent of Mexicans surveyed in a national poll believed the Southwestern United States rightly belongs to Mexico. Our government has not considered the longer-term consequences of immigration policies that no longer require assimilation as the cost of U.S. citizenship or residency. Mexico, on the other hand, has considered the consequences carefully and is taking action. Most of the ingredients the U.S. State Department considers necessary before calling for a plebiscite are already here: A large population of unassimilated foreign nationals and another government pretending to be their voice. The ingredient still missing is civil unrest or severe economic conditions that aggravate the delicate political situation. It is not my intention to be an alarmist since I do not know if it will take ten years or 50 years before the inevitable California plebiscite is demanded by Mexico. However, the irreparable harm being done to our claim of national sovereignty through uncontrolled immigration is a problem that needs to be addressed immediately.